Layout: Layout is always determined by function and space. While we always like to hear our client’s ideal layout, in order to give you the best advice, we will need to see a set of architectural plans. Ultimately, the architectural plans are how we create 3D renderings of the kitchen design, which will illustrate cabinet layout and elevations. It is important to never assume that there is only way correct way of laying out a kitchen. If you currently have a narrow galley kitchen, this doesn’t mean that this is the only layout that will work in your house. There are always ways to play around with removing walls and creating room for the layout you desire. Wood Species: As a design team, we will work with you to determine the type of wood species that is best suited for your needs based on the tones and style of your kitchen. The two wood species we highly recommend for kitchen cabinetry are rift white oat and walnut. White oak has a more subtle grain and is often quarter-sawn for custom cabinetry. It is very durable and has nice golden tones. 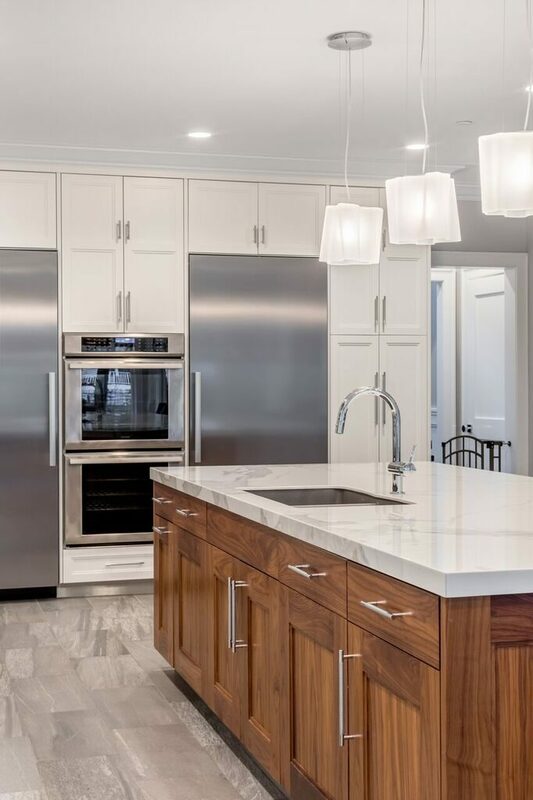 Walnut cabinets feature a smooth, fine and general straight wood grain, that is great for accepting finishes. Appliances: Appliances are an important decision that go hand in hand with the layout of the kitchen. 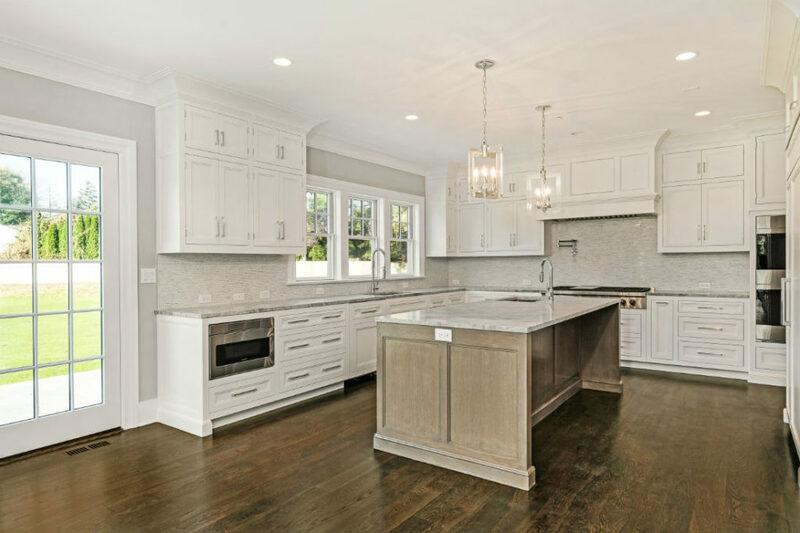 We will work with you specifically to suggest appliances and recommend the dimensions you need to best fit into the layout of your kitchen. The kitchen work triangle is a common expression used to describe the relationship between the refrigerator, stove, and sink. As experts, our goal is to work with you to create a customized plan for your work space in the kitchen based on what suits your specific needs. Door Styles: Cabinet doors are available with center panels that are either raised or recessed. Raised panel doors have a center panel that is raised from the rest of the door with a contoured edge for a more traditional look. Recessed panels, where the center panel is set lower than the rest of the door, are what we use for more transitional and modern designs. Overlay vs. Inset: Inset cabinet doors are set into the cabinet frame and fit flush with the face of the cabinet when closed. They are the most expensive, but work nicely to create a clean, smooth cabinet surface. You can also hide hinges with this type of cabinetry. Overlay cabinet doors completely cover the entire cabinet face. 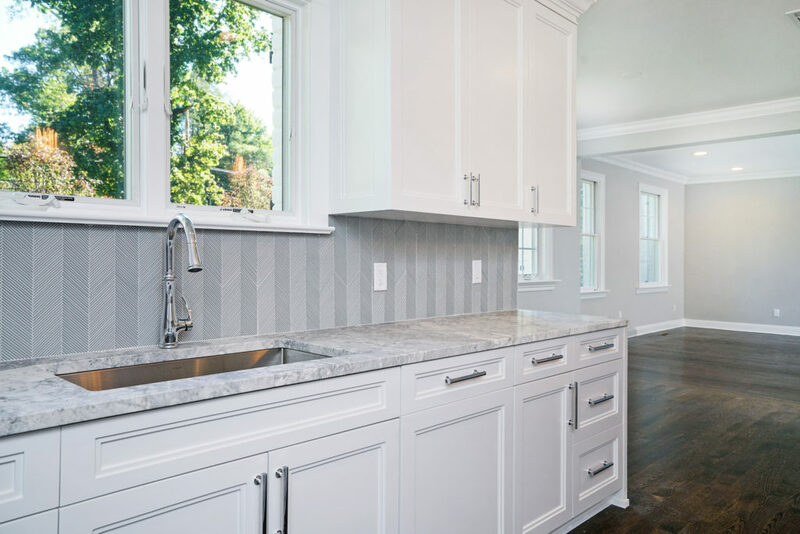 If you want an in between option, we recommend partial overlay, where the door sits on the cabinet face, leaving a small gap between the doors. Finishes: Perhaps the biggest question we get from our clients is whether our cabinetry is hand painted on site or baked in a factory. While some clients feel that baked cabinetry is more durable, we highly recommend hand painting cabinetry on site. Baked cabinetry sometimes tends to look fake and plastic looking. We work with high quality professionals who are experts at painting cabinetry so that there are no streaks or dust. With hand painted cabinetry, you have the option of changing your cabinetry color whenever you want. It is also easier to touch up any chips or scratches. With factory cabinetry, you would need to disassemble any cabinetry and send it to the factory to be repaired. Hardware: Based on the aesthetic you are looking for, we will suggest different sizes, style, and placement of hardware. While this seems like an easy decision, hardware can make a huge impact in the design of your kitchen. It should always tie into the style of the space as well as other fixtures in the room.